I guess it really didn't take long to find an appropriate bike (read: cheap) to store at my in-laws in Illinois, though in the short span I was searching, it seemed that it might never happen. Plastic ring has got to go. But Monday night I picked up a bike from a local Craigslist ad. 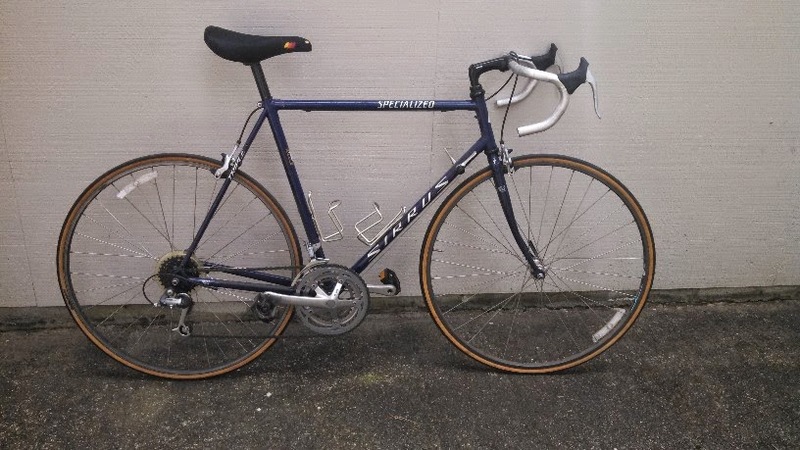 A Specialized Sirrus Triple, circa 1991-ish. 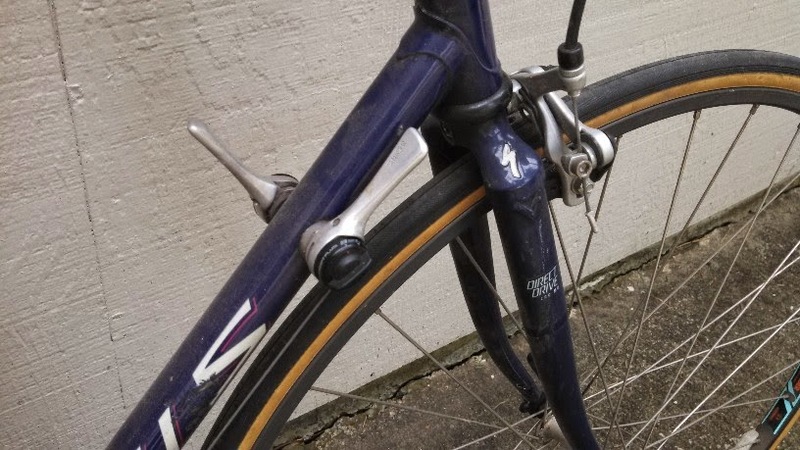 I talked with the seller for a while, and the story was one I'd heard many times before: bought the bike to do Seattle to Portland way back when, basically stored the bike after and never rode it again. Suntour Edge components, with single-pivot brakes, Wolber box-section rims, indexed 7-speed back end with a thread-on freewheel (hm... this could convert to a single speed easily) and down-tube-mounted shift levers, one-inch threaded steerer with quill stem, all steel. With a nice coating of dust. But the rear indexing is still dialed in... Makes me feel a little like a Velo-version of Bob Villa. * Swap the tires for something more suited to the potential of running on gravel roads. (half check -- I'll need a second one). 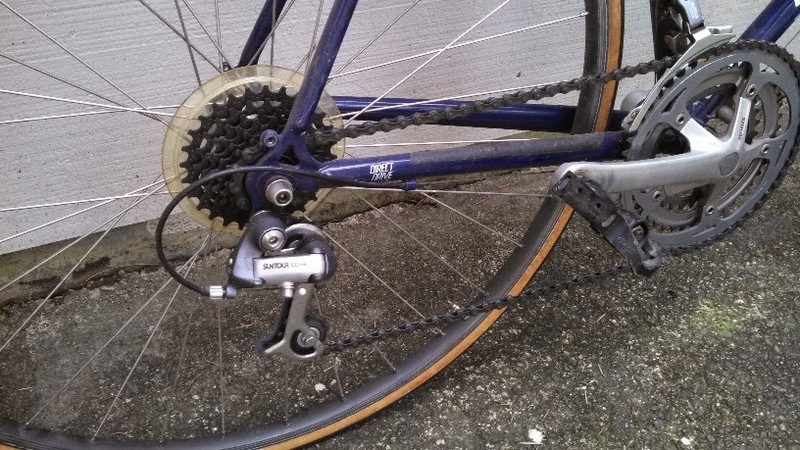 * Clean the drive train. 20 year old lube plus a healthy sprinkling of dust makes awesome grinding compound. * Repack the hubs. They're running the original grease, which is probably dried to a hard patina now. * True up the wheels. They're really close, but a little tweaking of the spokes will dial them in nicely. * File off the fork ends. Lawyer tabs? 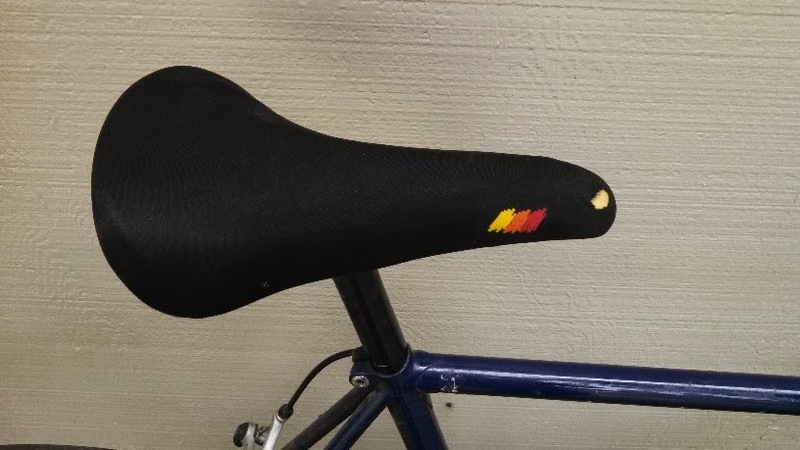 Uh, the quick release is supposed to be QUICK, eh? * Get a box to ship the bike to Illinois and pack it up. Nice shifters, still dialed in. And no extra charge for the coating of dust. That's not a whole lot, really, and won't cost me much of anything. While not a high-end bike, and likely not the perfect geometry for my liking, it'll do nicely for the week-at-a-time trips across the country when I don't want to hang up my cleats and get all stir-crazy. Edit to add: Upon beginning the disassembly, as in all projects, there's a thing called "scope creep". Meaning that the project grows as you dive in. 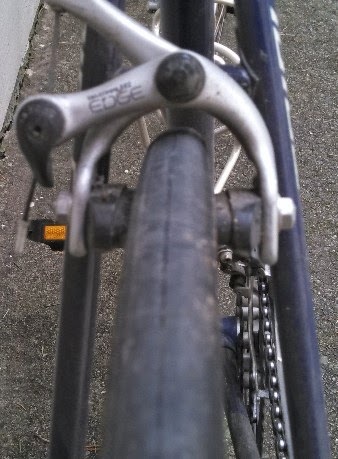 Nothing catastrophic, but the threads on the right crank arm stripped when I tried to take it off, I found that the chain was one good hard shift away from exploding, and the plastic under-bottom-bracket cable guide disintegrated as soon as I took the cable tension off. So far, though, that little plastic piece is the only one I don't have in the parts bin. Anvil Bikeworks weighs in on NAHBS.